If you have delicate, sensitive skin, McArthur Skincare has the ideal skincare package: Pawpaw-based products which use natural ingredients to clean, freshen, soften, and moisturise the skin, protecting it from loss of texture and suppleness. The pack includes 240ml of one of our most treasured products – the Complete Skincare Cream (NO ADDED FRAGRANCE). The No Added Fragrance version of this Complete Skincare Pack was created for people with the most sensitive and allergy-prone skin. It’s a fact that the Pawpaw fruit is packed full of vitamins, antioxidants and enzymes which give it a natural ability to replenish and maintain healthy skin - Pawpaw (Papaya, Papaw) is the skin’s natural friend. With the right combination of well-matched natural products, you gain the maximum benefit. The active ingredients are designed to work together while protecting sensitive skin. Start with getting your skin a silky-fresh clean: McArthur Skincare's Complete Skincare Soap contains 20% McArthur Pawpaw Extract™, using the power of concentrated Pawpaw (Papaya, Papaw) to gently cleanse, rejuvenate and exfoliate the skin to leave it feeling soft, moisturised and smooth. The Complete Skincare Soap is hand-made and is suitable for all skin types as an everyday cleanser all over the body, including the face. It cares for the skin as it cleanses. Replacing moisture regularly helps keep the skin looking and feeling its best and does much to prevent loss of skin tone and texture. What better than to do it the natural way, with active natural ingredients? Containing natural ingredients McArthur Skincare's Hydrating Facial Cream is an exquisite, fast absorbing, natural face cream that can help improve skin hydration and minimise signs of ageing. Used daily it can give you a smooth, clear enviable complexion. The more often you hydrate the skin on your face, the better your skin texture. When people make hydration a regular habit, the difference shows. 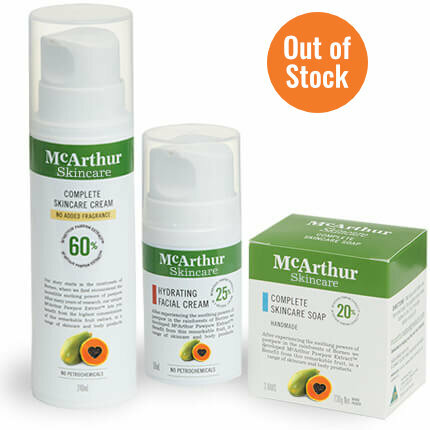 McArthur Skincare's Complete Skincare Cream (NO ADDED FRAGRANCE) is, we believe, the best in its class, with the highest percentage of Pawpaw extract in a natural cream on the market - an amazing 60%. That’s the maximum percentage of McArthur Pawpaw Extract™ in our natural cream. Complete Skincare Cream (NO ADDED FRAGRANCE) truly is LIQUID GOLD! It’s worth noting that many cosmetic brands producing specialised cosmetics include Papaya (Pawpaw, Papaw) as an important ingredient in their preparations. But by comparison, other pawpaw products contain less than 5% pawpaw extract. The Complete Skincare Cream (NO ADDED FRAGRANCE) is a product for maintaining healthy, vibrant, but sensitive skin. It’s ideal to maintain a vibrant complexion and can be used anywhere on the body. 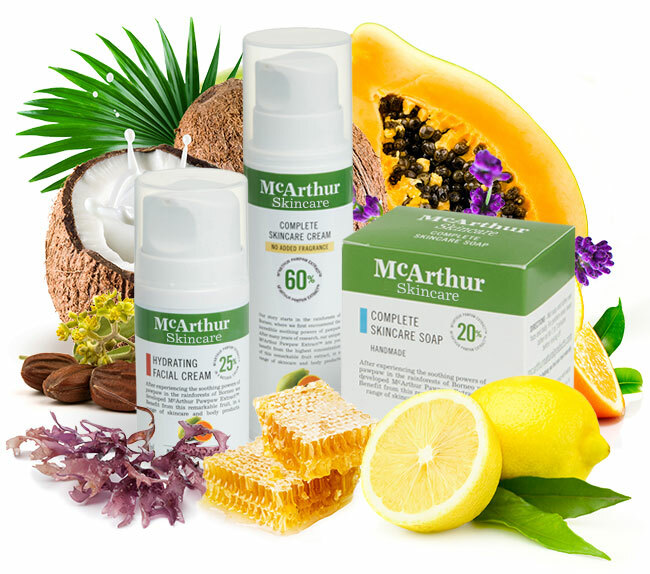 McArthur Skincare's Complete Pack (NO ADDED FRAGRANCE) is an ideal skincare package. Using natural ingredients, including our McArthur Pawpaw Extract™, these carefully chosen products clean, freshen, soften and moisturise the most delicate of skin. All active natural ingredients have been carefully selected and blended to care for sensitive skin and we avoid the use of petrochemicals, parabens or sodium lauryl sulphate. The ingredients included in Complete Skincare Cream (NO ADDED FRAGRANCE), Hydrating Facial Cream and Complete Skincare Soap combine to give your skin the best of care.